The story about the South Stream natural gas pipeline is not as simple as media want to present it and is not as complicated as some politicians want it to be. The idea to start with was a gas pipeline financed by Gazprom – the Russian national energy giant – that would bring gas to Europe via the Balkans avoiding Ukraine. For many and good reasons. Here we are talking about a huge project that would deliver 63 billion cubic meters of natural gas through Bulgaria, Serbia, Hungary and Slovenia before entering Italy. Even Greece was included a few years ago before withdrawing under political pressure. The project also included huge rent profits for the countries involved; profits much needed in the situation their economies stand at the moment. Europe is a continent constantly thirsty for energy and Gazprom reserves guarantee that whatever happens with the oil prices or the Arabian oil reserves there is a constant flow of energy to the European homes and industry. Apart form the, the last two decades Russia has used Gazprom as an ambassador of good will to smooth relations with European neighbours and especially Germany. But the political games played with these pipelines don’t stop in the god will and ambassadorial status. They have been already used as a tool of political pressure to Ukraine. But this is where politics turned a simple capitalist commercial exchange into a drama. Gazprom wants to expand to new markets and is willing to pay the coast for that; and that aiming to huge profits in the future and somehow investing in the fact that it can be the alternative to the Arabian oil in Europe. There is nothing wrong with that and this is how capitalism and free markets work. Things got a bit complicated in Ukraine. Ukraine standing in the crossroads between Russia and Europe hold a key point to this expansion at least regarding coast and practicality. That gave Ukraine a strong negotiating card that gone all the way to Ukraine sometimes “forgetting” to pay her gas bills. Russia was patient for a variety of reasons; including the fact that Russia historically considers Ukraine part of the empire, and the strategic position of the country in a case of a conflict. Then things got a bit more complicated for Ukraine and a series of colourful revolutions all of them definitely anti-Russian led mainly Putin to use extreme measures including the fact that Russia totally controls Ukraine’s needs for energy. Now, this was a two edges sword for both sides. The Ukrainian debt to Russia due to decades of not paid gas has reached impossible heights for the Ukrainian national financiers and the same time the Ukrainians blackmailed the Russians for cheaper gas and much higher rent in exchange of their good behaviour and not turning more NATO oriented. Russia held the same time Ukraine by often reminding the legal debt and the fact that they hold the switch and if they wanted they could let Ukraine totally dry in energy. Russia, as every good capitalist entrepreneur would have done, decided to work a plan B since Ukraine was becoming more unstable and unpredictable. And the South Stream was a good plan B. and Gazprom followed all the rules with long intergovernmental meetings, profitable offers and in some cases the final contracts went even through the local national parliaments for approval. And everybody was happy. Then things in Ukraine got a bit more heated and Greece was the first to withdraw. Not much harm, it just took a bit of adjustment in Gazprom’s plans. But then things got a lot hotter and suddenly the pipeline became part of a political negotiation where the rules had changed and they had absolutely nothing to do with capitalism and free market. A strange coincidence. 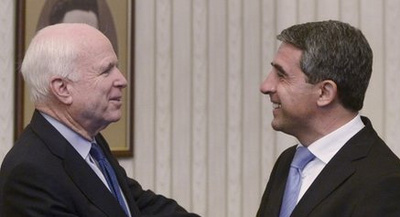 Days before Slovenia started expressing thoughts if they were going to keep their part in a signed agreement John Mc Cain was visiting the prime minister. Weeks before Bulgaria, key country for the expansion of the pipeline halted the works on the project with no good reason John Mc Cain was in talks with the prime minster. Actually John Mc Cain seems to be visiting every single place in East Europe where anti-Russian flames start rising a series of questions. Is Senator John Mc Cain the Trojan horse of the American foreign policies? Does Senator John Mc Cain represents Barack Obama and is there a u-turn to Obama foreign policies in Europe? And the critical question, what the hell senator mc Cain does? Does he plans to start the WWIII in Europe or is he hallucinates the rebirth of the good old days of the cold war. And if he does that under what authority and what approval? Plenty more questions. What does senator Mc Cain have promise or keep promising to all these governments and countries in exchange to change their attitude and actually discredit sign intergovernmental agreements with unpredictable consequences for the economy of the countries? The simplest thing Gazprom can do following international laws is to take Bulgaria to the court accusing the country for economic damage and demand billions of dollars. And the funny part is that they are going to win the case. Nobody says that Putin plays fair in this case but how can you talk about fair with Mc Cain turning capitalism into war games in a field that is not even his and the consequences will never touch him. And the question remains. Is Mc Cain representing American policies in Europe? And if it how Europe answers to that challenge and provocation? If it is not shouldn’t Barack Obama give some explanation or Mc Cain in his stupidity really serves a cause? Mc Caine’s bizarre political behavior comes as no great surprise. He fancies himself a genial foreign policy expert and goes around the world as if he were ambassador at large appointed by President Obama, which he definitely is not, and suggesting that President Obama should promptly fire his whole national security team and perhaps appoint him as the supreme brilliant executor of foreign policy. There was a time when the unwritten rule was: criticism of the president stops at water’s edge. No more with a party who is fast slipping into a fascist mind-set. Now, no opportunity is ever missed to criticize and cast aspersion on anything and everything the president proposes or tries to implement. The name of the game seems to be extreme unilateral partnership and sabotage of the administration, never mind compromise and the common good of the country and its allies. Both he and Romney now go around saying “I told you so” on Iraq forgetting the fact that an unnecessary war in Iraq was promoted and approved by both of them under George Bush. Colin Powell was sent to the UN to give false evidence for its rationale. It appears that those two wannabes are still smarting under the realization that Obama beat both of them at the presidential race. It appears that the defeat still sticks in their throat. In any case despite the impressions Mc Cain wishes to create, one thing however is sure, he is no ambassador for President Obama, if anything he has become, together with practically the whole of his party, an obstructionist unconcerned with the genuine interest of the country. Speaking of pipelines, Mc Carty and his whole right-leaning obstructionist party wants Obama to approve the building of a pipeline from Canada to the Gulf of Mexico, never mind the concerns and the objections of environmentalists. The party as a whole has brought Obama to task for opposing the idea. Indeed Mc Carty is no friend or ambassador for Obama, neither is he a friend of the US people despite his pious pronouncements on patriotism and love of freedom, free speech and country. Pity. Errata: in the last paragraph of the above comment, Mc Carty should read Mc Cain.